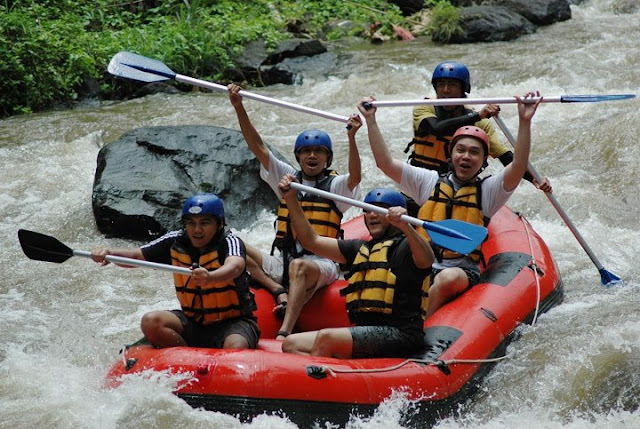 Bali Rafting Tour is a Bali Activities / Adventure Tour Packages to enjoy wide range of white water rafting adventure in the paradise island of Bali. Feel the experience of Bali White Water Rafting Tours at the best and most popular river at Telaga Waja River and Ayung River Ubud. 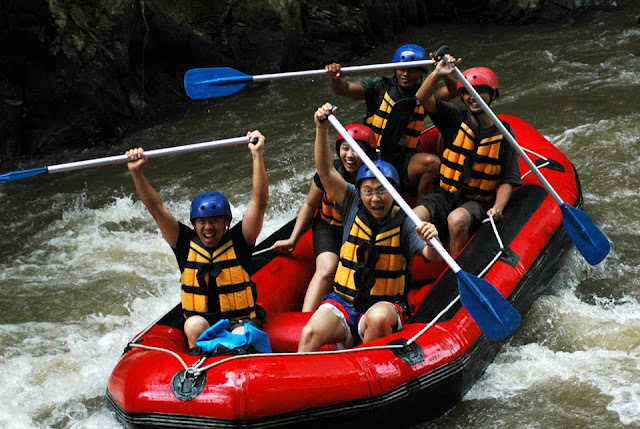 Rafting is the most choices adventure in this Bali islands, the activity offer you an amazing experience by beating the water rapids challenge from different class and also admire the beauty of rice paddy before reach the start point and see the spectacular view in the river. Bali Rafting Tour is to discover hidden waterfalls, swim in the pristine water and feel the thrills of the paradise river. The rafting guide is already experience in the white water rafting tours by offer an excellent service to make you more enjoyable and also know the perfect spot where you can enjoy the most challenging water rapids. Beside that the rafting guide can be your assistant if you would like to take picture with your own camera. 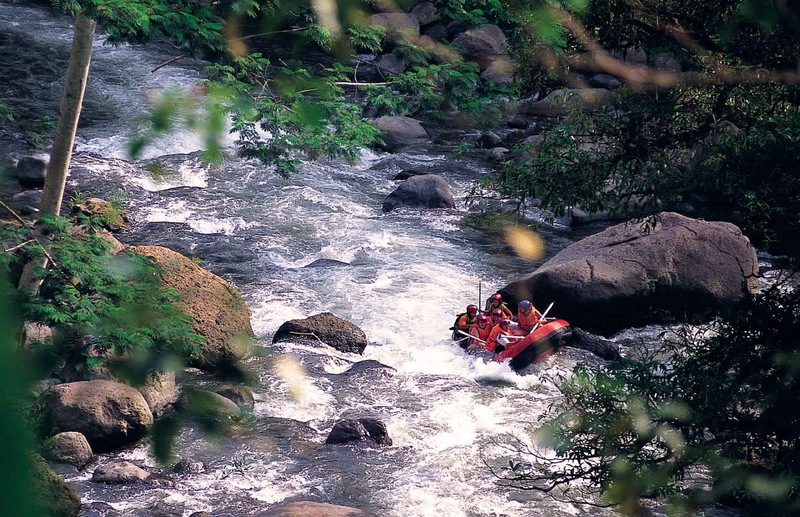 Memorize this white water rafting activity by use the video and picture service. The first river has the medium challenge rapids is Ayung River Ubud, the river located in northern Ubud, The length of ayung river is 12 km, the rapids level 2 & 3 rapids. The duration of the rafting is around 2 hours in the river, The river is slightly larger, but have access a more difficult and thus require strong legs to get to the rafting start point. 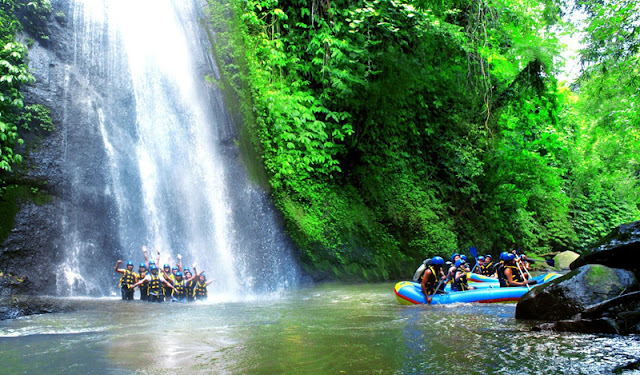 Bali Golden Tour offers this exclusively stretch of untouched river in a choice of daily rafting sessions where you will travel through formerly unseen river splendor with daring, exciting and challenging new rapids to add to the thrill of Bali's longest White Water Rafting trip. Choose different Class 2 & 3 or 3 & 4 rapids challenge of white water rafting and encounters on vortexes of swirling and funneled waters, natural ramps and sudden drops in elevation and adrenaline pumping action which can be safety experienced by anyone from 5 to 65 years of age. Your Bali Rafting Tour starts with a custom fit-out of life jackets, helmets and paddles in our state of the art equipment centre before being led to our new start point via impeccably engineered stairs complete with stainless steel safety handrails and scenic stop off points with breathtaking views. For those want to bring their own camera or mobile phone for taking picture you can bring the water proof bag, if you doesn't have it, we provide for free to use. An expert safety briefing session with qualified guides follows before you launch into a Bali Rafting Adventure where photo opportunities abound every turn. 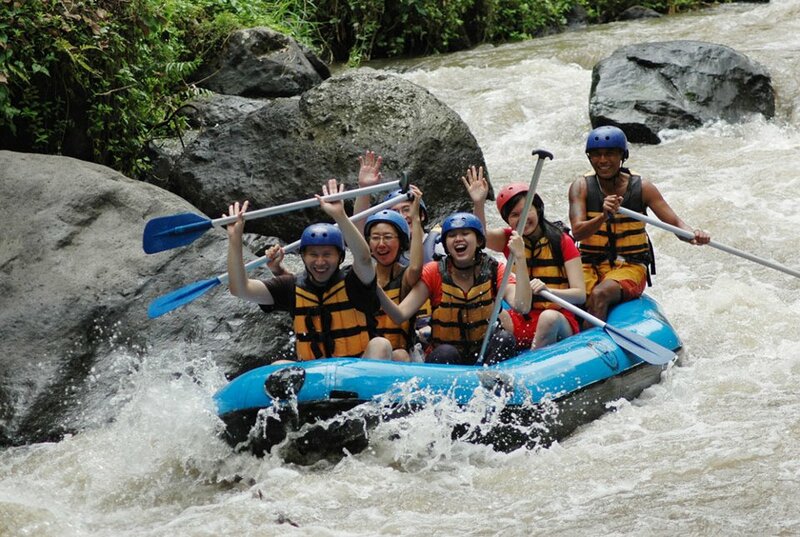 Bali Ayung Rafting Is one of the best Bali Rafting Tour in northern part of Ubud with the beautiful and high riverbank. 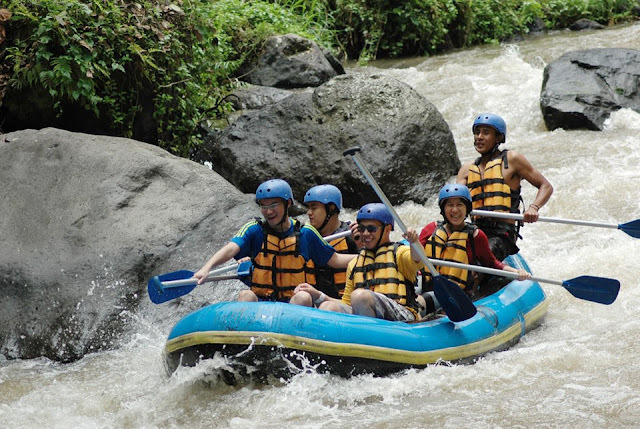 Ripples irrigate the river rock, tracing Bali nature pass the river which is full of fun and pass the attractive and challenging rapids are the impressive Bali Rafting experience on your vacation in Bali. An impressive Bali Rafting experience trace the Ayung River Ubud Bali. Enojoy this rafting adventure during your holiday. Bali Telaga Waja Rafting Is located in the eastern part of Bali is the best Bali Rafting Tour in the island. 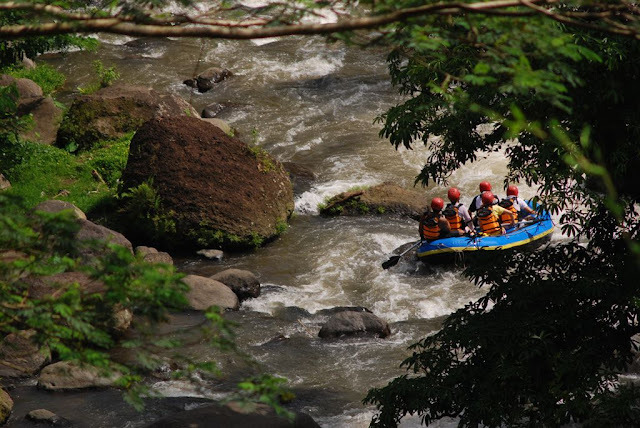 Telaga Waja River is the best river for Bali Rafting and the longest challenging rafting river, starts to runs southward Bali from southern slope of mount Abang. Bali Rafting Tour company that is ready to assist and accompany you to explore the beautiful panorama and the extreme current of Telaga Waja river, Karangasem.